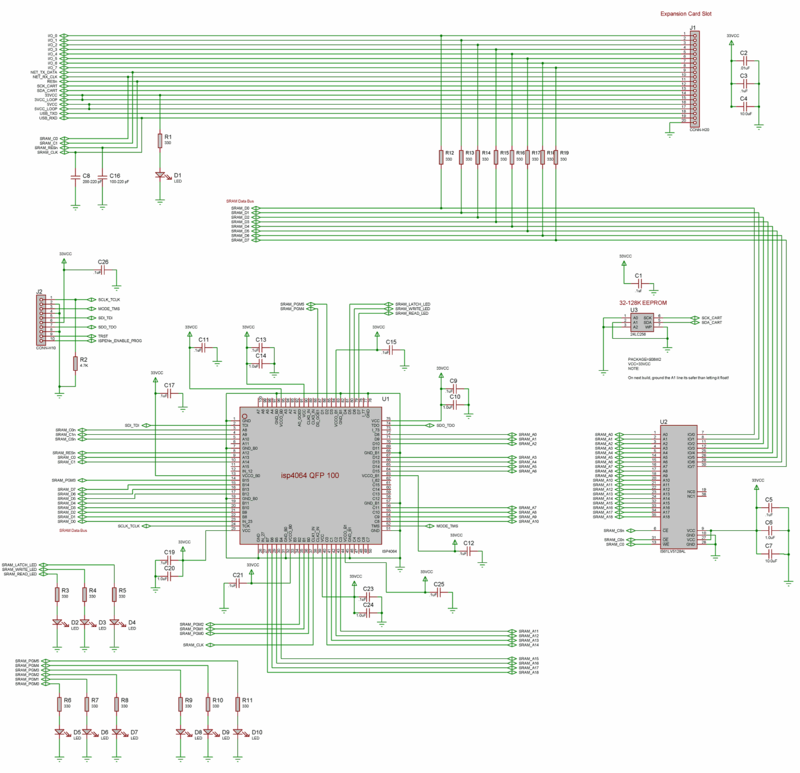 Supports 512K of SRAM thru a single BYTE wide bus and a handful of control lines. Directly addressable lower 64K of SRAM. Upper 64-512K accessible thru block reads/writes. Programmable post increment/decrement after reads/writes allowing for high speed block access. Most operations can be performed in a few ASM instructions. 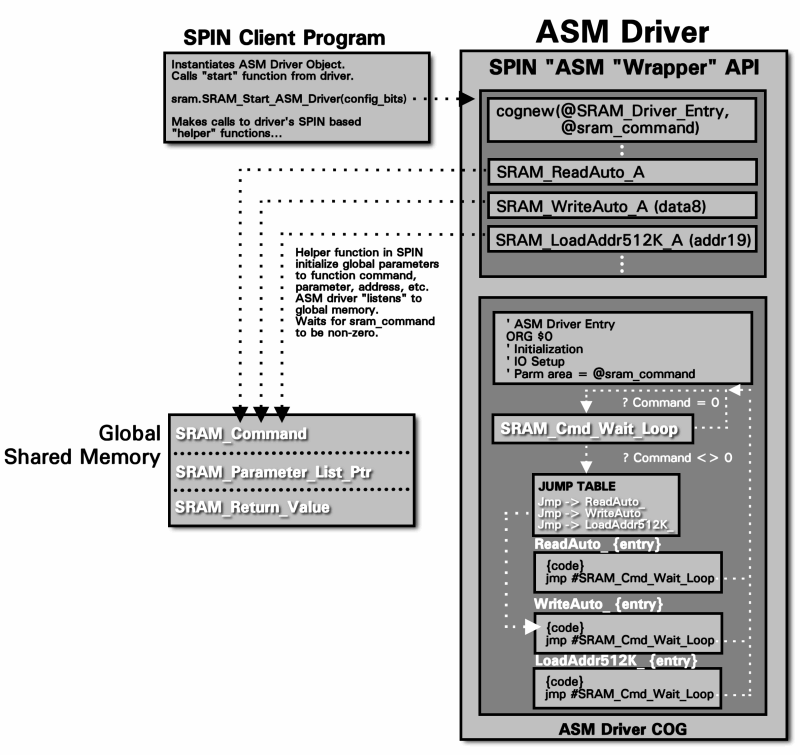 SRAM can be accessed as fast as global (HUB) memory in many cases from within a COG. Built in 128K EEPROM on board, so firmware can be loaded onto EEPROM rather than HYDRA main board. Lots of LEDs for status and debugging uses! Re-programmable CPLD along with complete instructions and designs for a DIY programmer for under $10 of parts! 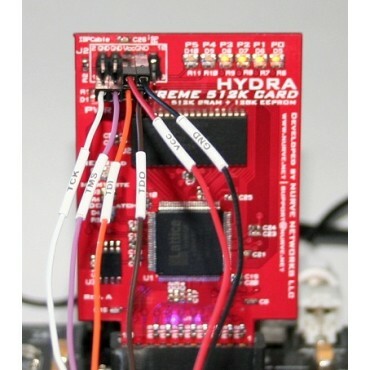 HYDRA XTREME 512K SRAM Card Programming Manual (.pdf). 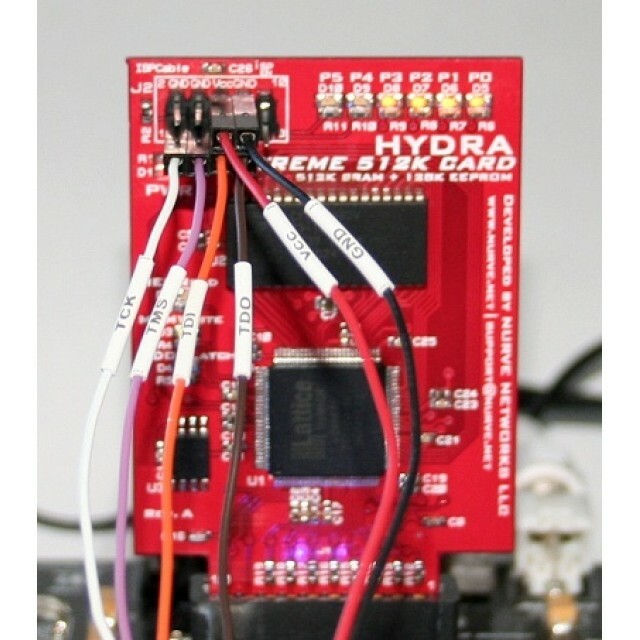 HYDRA XTREME 512K SRAM Card API/Drivers (.pdf). Lattice CPLD Data Sheet (.pdf). 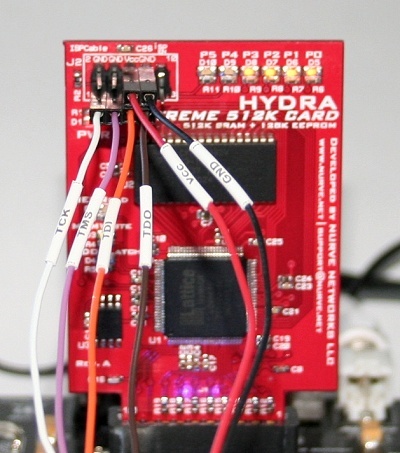 The HYDRA™​ XTREME 512K Card (HX512) completes the HYDRA™ system giving it a full 512K of Static RAM (SRAM) and 128K BYTE EEPROM for program storage. 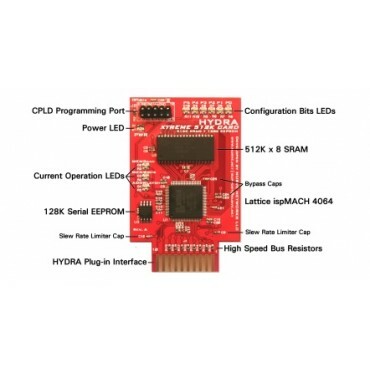 The interface between the HYDRA and the HX512 is made possible by a state-of-the-art Lattice ispMach 4064 Complex Programmable Logic Device(CPLD) which acts as the memory controller and"glue" logic interfacing the HYDRA and the HX512. The CPLD is used to address the large 512K memory as well as act as a simple memory controller that is capable of auto increment and decrement functionality to help accelerate your code. With this exciting addition to your HYDRA, it literally transforms the HYDRA into a full featured 32-bit computer that can host large programs, operating systems, interpreters, compilers, and more advanced games and graphics applications. Additionally, the Lattice CPLD can be re-programmed with an 3rd party programmer or one your build (instructions included on CD-ROM). 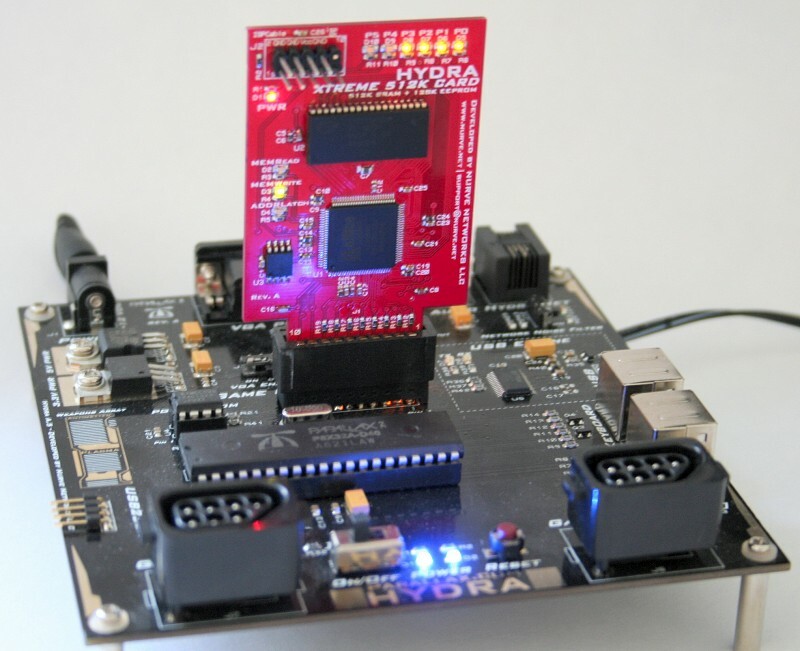 By re-programming the CPLD, you can literally change the "personality" and behavior of the HX512 altering it to suit your needs as well as using the HX512 as low-cost CPLD development kit. CPLD development tool included on CD-ROM. In addition to the hardware is a complete software API suite consisting of both a SPIN based API and highly acclerated ASM API. 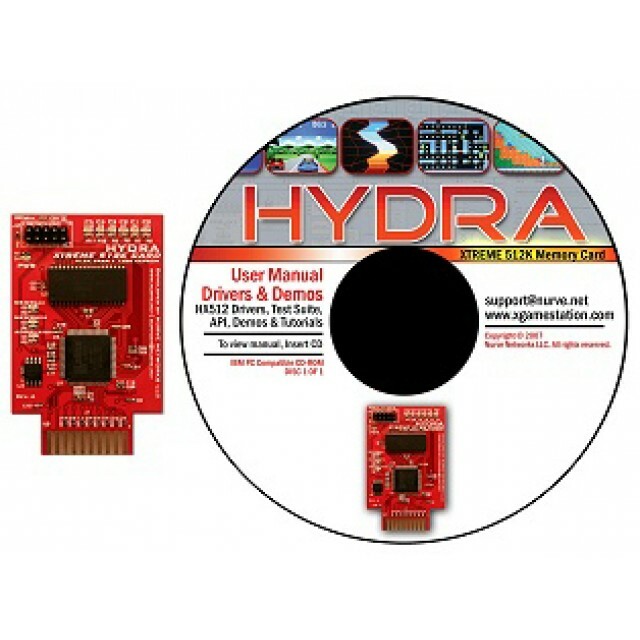 Both APIs are well documented in the HYDRA XTREME 512K SRAM CARD Programming and User Manual that comes on the CD-ROM. Over 80 pages of illustrations, explanations, and source code will get you jump-started with the HX512! 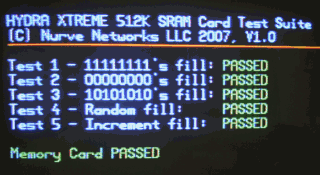 The HYDRA XTREME 512K SRAM Card. PC compatible CD-ROM with drivers, source, demo & complete programming manual.